Where can I see the European Airstream models? Our central showroom is in Merenberg, near Limburg at highway A3 where we do have all European Airstream Travel Trailers and Airstream Diners on display. For our guest arriving at nearby Airport in Frankfurt we do offer a free shuttle service to our showroom and back. For more information about our showroom and opening hours can be found here. Airstreams are timeless design icons with over 85 years of tradition. 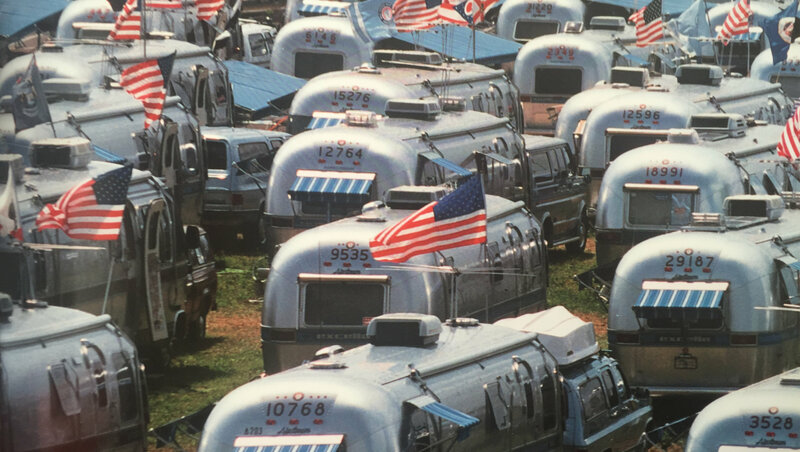 More than 65% of all Airstreams that were ever built, still exist. Airstreams are typically owned by their first owners for many years and sometomes even passed on in the same family. If you ever want to sell your Airstream, you can will experience an outstanding high resale value. Demand for preowned Airstreams has always been mich higher than offers. Airstreams are never old fashioned. According to the philosophy of the Airstream founder our products are carefully maintained but not radically changed. The unique design of Airstreams is unmatched. More than 86 years of tradition. The Airstream brand owes its worldwide awareness of the long history and the legendary international caravans of founder Wally Byam. But even today the Airstream community is very active and welcomes many new members every year. What is the difference between European Airstream models and the US Airstreams? Why do you offer special European Airstream models? Of course, it would be much easier if Airstream could simply sell its U.S. models in Europe. Unfortunately, there is a variety of reasons standing against it. US Airstream models are purely designed for the US market and meet the local technical and legal requirements which differ significantly from the European ones. Everything is slightly larger in USA inlcuding the streets. Taking advantage of wider roads, trucks, motorhomes and caravans are also built wider than in Europe. All US Airstreams avobe 23 feet total length are only offered in 2.58 meter width. Together with the awning, they are even up to 2.68 cm wide and therefore illegal to be driven on European roads. European models are built to a maximum width of 2.43m. The 2.3-meter-wide variant of the Airstream 534 and 604 is not offered at all in the United States. The most popular tow vehicle in USA is the Ford F150 Pickup. Being a 1,5 ton truck it has a heavy duty suspension in the rear and needs quite some tongue weight for a smooth ride. The general rule in the US is that any trailer should have a tongue weight of about 20% of its max weight. With a 3-ton trailer, this equals to about 600KG. The tongue weight of a trailer is determined by the position of the axles. Axles on US models are positioned further back than on European models. The position of the axle cannot be changed easily as floorplans are specifically designed to to cover the wheel boxes inside. Adding balance in the rear to compensate tongue weight puts additional stress on the chassis and results into an unsatisfactory driving behavior. Therefore, it is NOT recommended by Airstream and will void any warranty. All European Airstream Floorplans are designed upfront to have the axles positions in the middle and reduce tongue weight to the European standard of maximum 150KG. In the United States, the standard for voltage is 110 volts versus 230 volts in Europe. Heating system, fridge, microwave, battery charger and electrical outlets are operated at 110 volts in the U.S.. European models are designed for 230 Volt operations. All appliances are supplied by European suppliers to guarantee service and replacement if needed. Trailers in the US use electric brakes, which require a break controller, installed in the tow car. The parking brake in the USA also requires permanent 12-volt power supply whereas a fully mechanical parking brake is mandatory in Europe. European trailers up to 3.5 tons use surge brakes that operate fully mechanically and are compatible with every towing car without any electronics involved. The parking brake also works fully mechanically. Homologation of trailers with electric brakes in Europe is theoretically possible but quite complicated and you will hardly find any service company that know the system and supplies spare parts if needed. In many regions of the United States Caravans barely ever get heated but air-conditioned. US Airstreams are therefore equipped with a standard air blowing heating system. Alternatively, the air conditioning is often used as a heat pump to produce warm air. As climate is much cooler in Europe, all our models are equipped with the ALDE water carrying central heating system. Up to 14-meter of radiators are installed in each trailer. The result is a very pleasant indirect heat that spread passively without a fan in the vehicle. Not having an air blower also significantly reduces formation of dust. Supply of spare parts and warranty. All new models in Europe have a 2-year factory warranty. All major components suppliers have a Europe-wide network of service partners. Is there an Airstream Club in Europe? Due to the ever-growing number of Airstream owners in Europe the establishment of a European unit of the Wally Byam Caravan Club International ws a logical consequence. The WBCCI Europe is the youngest unit of WBCCI with a rapidly growing number of members in the whole of Europe and was founded in July 2015. A membership in the WBCCI Europe is open to all Airstream owners in Europe and is the key to participation in the events that the Club makes unique in the world.